Philippine Seven Corporation President and CEO, Jose Victor Paterno (left) and Chevron Philippines Inc. Country Chairman, Louie Zhang (right) as they celebrate the 7-Eleven 100th store opening in Aseana Square. Demonstrating eight years of shared commitment and solid partnership, Philippine Seven Corporation (PSC), the exclusive licensor of global convenience store chain giant 7-Eleven, and Chevron Philippines, Inc. (CPI), the marketer of the Caltex fuel brand, celebrated the recent landmark opening of the 100th 7-Eleven-Caltex store at the Aseana Square along Macapagal Avenue in Pasay City. 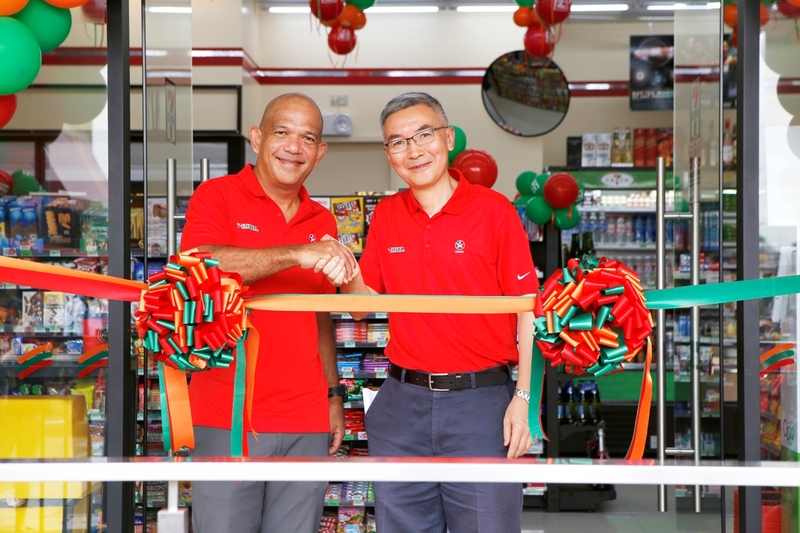 The newly opened C-store, which brings to 2,209 the total number of 7-Eleven stores in the country, is expected to further accelerate the aligned growth prospects of PSC and CPI for the coming years. Both PSC and CPI vowed to continue innovative efforts to deliver products and convenient services that will enhance overall customer experience. In his welcome speech, Louie Zhang, the new Country Chairman and General Manager for Philippine Products of CPI, said he is pleased to witness the milestone occasion that reflected the successful and enduring collaboration between the two leading enterprises. “We thank our partners for making this successful opening happen. This is really something important for us. We are committed to making this partnership stronger. Our eight years of partnership has built success and confidence and will continue to inspire us to bring this business to even greater heights. We are looking forward to seeing more joint endeavours, with this milestone serving as a foundation for more successful projects ahead.,” Zhang said. For his part, Jose Victor Paterno, President and CEO of PSC, congratulated the team-up of PSC and CPI, acknowledging how it revolutionized the brand of convenience in the country while strategically leveraging the marketing and retail strengths of both organizations. He said the two organizations continue to share a commitment to serve and provide services for customers – from everyday passers-by to motorists in the metro as well as in key provinces and cities in the country. “In other countries such as the US, convenience and fuel go side by side. In the Philippines, while car ownership is still an emerging market, we see this increasing segment as a factor that will help accelerate our expansion, more store openings together with Chevron,” said Paterno. The creation of the 7-Eleven-Caltex store format, according to Paterno, has spawned greater convenience features that allow consumers access to round-the-clock services and grab-and-go food, grocery supplies and fuel refilling --- all in one strategic location. “The value-added offering for customers and motorists, which 7-Eleven stores and Caltex refilling stations have served dutifully in the past eight years, has and still is dynamically reshaping the landscape of modern retail convenience in the Philippines. We are proud to be long-standing partners in the industry. As the pioneers of this concept, we are looking forward to deliver more products, services and exciting deals to our loyal patrons,” he said. In line with its 2017 expansion target, Medina revealed that the company will continue to scale up its C-store network with the opening of 25 more 7-Eleven-Caltex branches in the provinces, specifically in the Visayas and Mindanao. “We are well poised to meet our growth goals as we end 2017,” he shared. These new territories, according to him, will further cement 7-Eleven’s dominant presence across the country. “The company, which is deeply motivated by this milestone along with the momentum that came about from other significant ventures in the recent months, is positively looking to add C-stores. The new territories that will open up hopefully by next year include Region 2, Mindoro (Calapan) and Tacloban (Ormoc),” said Medina. PSC currently operates 1,031 corporate stores and 1,178 franchise outlets. For franchising inquiry, call 0917-9935059 and 0935-3236431 (Visayas); (02) 7269968, 0920-9508651, 0917-8711686 (Luzon) or email franchising@7-eleven.com.ph or visit www.7-eleven.com.ph.